WASHINGTON (Army News Service) — Budget challenges loom in the Army’s future. In fact, just about any portion of the federal budget could be cut to help the United States reduce its yearly deficit. In fiscal year 2011, the government spent an estimated $1.6 trillion more than it collected in revenue. In fiscal year 2012, it’s estimated the government will spend about $1.1 trillion more than it takes in. The Department of Defense, and all services, including the Army, are potential targets for deficit reduction. Odierno, the 38th chief of staff of the Army, spoke Oct. 6 before a House Army Caucus breakfast attended by lawmakers from both sides of the aisle, as well as Army general officers and senior Army civilians. He told lawmakers that budget reductions must be made in both DOD and the Army, but said those cuts must be done in a way that allows the Army to continue to be an elite fighting force. The general said he fears poorly planned budget cuts could lead to the return of the “hollow force” he experienced at the start of his military service. He entered the Army in June 1976, less than three years after the last U.S. military personnel exited Vietnam. The challenge in the post-Vietnam era was to prepare the Army for whatever missions lay ahead at a time when defense budgets had been cut to coincide with the end of American involvement in that conflict. The general warned against placing faith in the idea that when the current wars end, ground forces will never be needed again and that budget cuts should reflect that. The idea presented itself before, he said, and was quickly proven wrong. 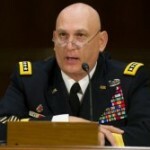 Odierno said that when the Berlin wall came down in 1989, he was witness to conversations that predicted cessation of future conflict. “We’ll never fight another war. We’ll never have to deploy our ground forces ever again. We have solved the problems, we will have peace for as far as we can see,” he recounted. But after the fall of the wall in November 1989, there was Operation Just Cause in Panama, where the U.S. overthrew Gen. Manuel Noriega. In 1991, the U.S. entered Operation Desert Storm, to liberate Kuwait from Iraq. There was also Operation Provide Promise in 1992 in Bosnia and Herzegovina, Operation Allied Force, which was part of the Kosovo Conflict in 1999, the entrance into Afghanistan in 2001, and the beginning of operations in Iraq in 2003. “We can sit here and say we are going to have peace and we’ll never need our military anymore — but I think we’re putting our heads in the sand,” he said. Odierno said as the new chief of staff, he’s focused on continuing to prepare Soldiers — to provide trained and ready forces to send into combat. Also, he said, the Army must look to balance capabilities to meet future threats. Agility, adaptability and deployability are key, he added. He also stressed that the Army provides depth. Odierno said between 35-40,000 of the Army’s end strength is special operations forces, and pointed out that those Soldiers don’t just come in off the street. “They have had experience, they have to develop critical skills as we get them ready to do these missions,” he said, adding that they are a product not of recruiting, but of an all-volunteer force. Those are Soldiers, he said that have willingly joined the service, and that take pride in serving.